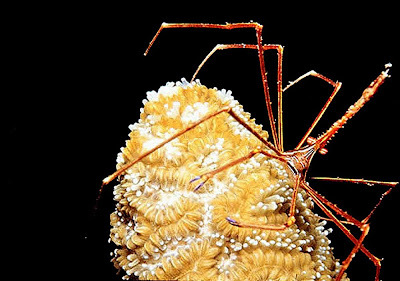 Sander sent the arrow crab of Bay Islands, Honduras along, and reminded me of a dark memory I had while scuba diving years ago. We were in the Sea of Cortez diving a wrecked tug boat. It was gloomy and eerie and perfect until I looked into the corners and windowsills and saw that they were inhabited by crabs not unlike this crab: the daddy-long-legs of the ocean. Arachophobes such as I can never get a reprieve from our fears, even at 60 feet below (and this one has pincers). oh crazy! this is one of my favorite stops in the WORLD!!! Thanks for making my day better! "Arachophobes such as I can never get a reprieve from our fears, even at 60 feet below (and this one has pincers)." -You should see the spider-like things in space. This gave me chills just looking at the picture. Thanks for reminding me why I haven't been scuba diving!